CSR Research Scientist Dr. Himanshu Save is an author on a study published in Nature Communications, for the first time using GRACE data to gain insights into sediment discharge from major rivers. Continental erosion can be enhanced by human activities like large-scale agriculture, deforestation, sand extraction etc. Erosion produces sediment that is mostly evacuated by rivers which shapes the delta downstream and carries organic matter and nutrients to the Ocean. The global sediment discharge to the ocean remains unknown and its measurement is a daunting challenge in Earth Science. 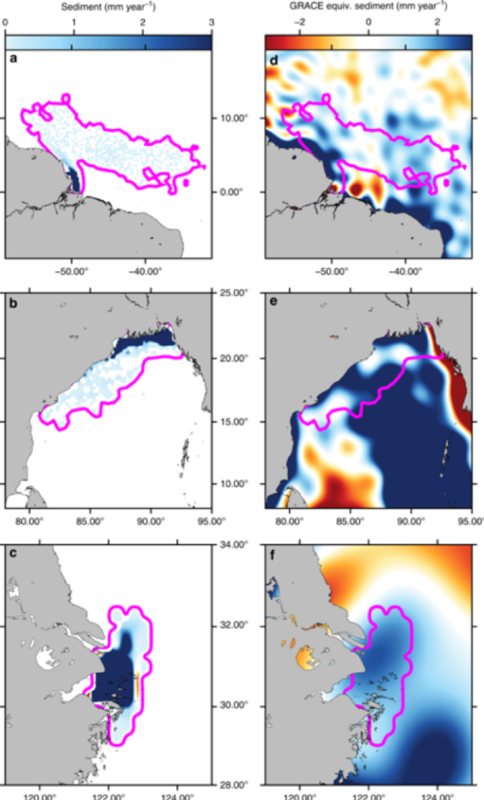 This study brings new perspectives for monitoring of continental erosion and rates of sediment mass accumulation out of large rivers using satellite gravimetry like GRACE. The GRACE data used in this study was processed and prepared by Dr. Himanshu Save at the Center for Space Research at the University of Texas at Austin. Dr. Save is a co-author on this study led by Maxime Mouyen at Univ Rennes, CNRS, Géosciences Rennes. The study demonstrates that the annual sediment loads estimated from GRACE for 7 major rivers (Amazon, Ganges-Brahmaputra, Changjiang, Indus, Magdalena, Godavari and Mekong) are consistent with in-situ estimates. This study highlights how gravity missions like GRACE can complement the in-situ measurements by widening the range of spatial and temporal scales. The study concludes that GRACE and future gravimetric missions are unique tools for assessing modern sediment discharge of large rivers at global scales. This study is yet another example of pushing the limits of GRACE data and opening new opportunities for GRACE data in wider Earth Sciences community.